Have you ever turned $3,000 into $100,000 using options? We have, twice! If you are up for a Challenge, come join us as we go for $100,000 again! The 100K Challenge is a unique trading approach turning the options game from stock picking to reward managing. Trading options gives us the ability to risk a small amount and still realize great rewards. Want to learn the rules of the game? To quickly get you up to speed, we have developed several videos to get you going. Over the years, we have developed several algorithms and market tools for our traders. We use these market and stock signals and apply them to many of our option trades for the 100K Challenge®. This is where the action happens. Live video streams of our traders talking trades, the market, and whatever else peeks their interest are broadcasted during the week. A chat room is occassionally available as means to connect with our traders and other members of the community. There is no need to sit on this all day though. Videos are recorded and trades are sent via email, sms, and twitter. 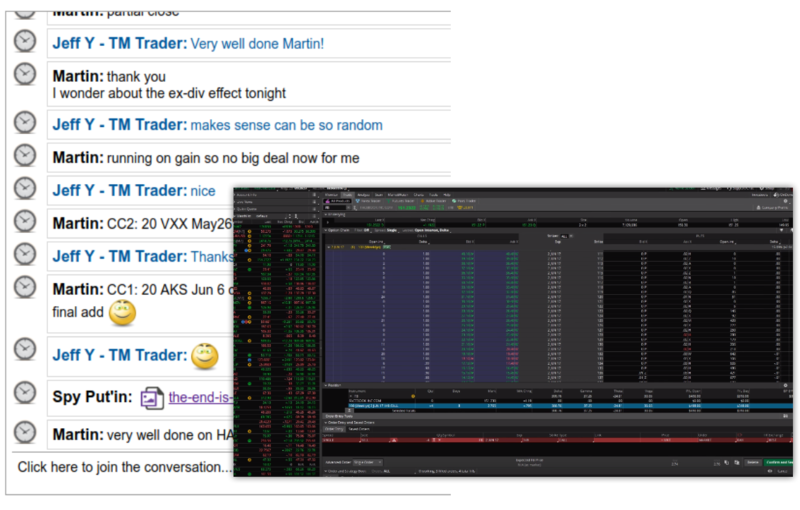 "Again thank you and the rest of the TraderMinute team. What another great day of learning and earning." "TraderMinute is seriously the voice of reason. That was a good trade for me!" "Love to have TraderMinute on any time & all the time." "What helps me the most is TraderMinute's acumen of 'managing risk' first, and everything else is later. It's changing my perspective of trading." "I enjoy just listening as it is very calming which teaches me patience in trading that I have never had before."